It is obvious that if overhead power lines are not properly insulated from their support poles/towers, the current will flow towards the ground through the poles/towers which also become hazardous. Of course, the power line won't even work in that case! Hence, overhead power lines are always supported on insulators mounted on their support poles/towers. high mechanical strength in order to withstand the conductor load, wind load etc. 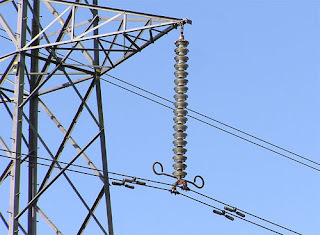 Most commonly used material for overhead line insulators is porcelain. But glass, steatite and some other special composite material may also be used sometimes. 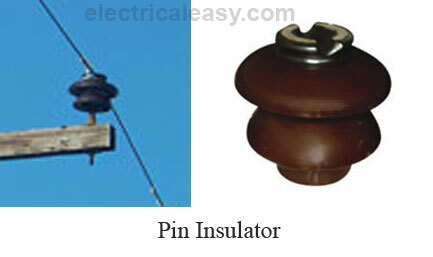 Pin type insulators or pin insulators are popularly used in electric distribution systems up to 33 kV voltage level. They are secured on the cross arms of the pole to carry power lines. There is a groove on the upper end of a pin insulator for housing the conductor. Conductor wire is passed through this groove and secured by binding with the same wire as of conductor. A pin insulator is usually made from porcelain, but glass or plastic may also be used in some cases. As pin insulators are almost always employed in open air, proper insulation while raining is also an important consideration. A wet pin insulator may provide a path for current to flow towards the pole. To overcome this problem, pin insulators are designed with rain sheds or petticoats. Beyond operating voltage of 33kV, pin insulators become too bulky and uneconomical. An insulator must be properly designed so as to withstand mechanical as well as electrical stresses. Electrical stress on insulator depends on the line voltage, and hence, proper insulators must be used according to the line voltage. Excess electrical stress can break-down the insulator either by flash-over or puncture. Flash-over: In insulator flash-over, electrical discharge occurs by forming an arc between the line conductor and the insulator pin (which is connected to the cross-arm). The discharge jumps through the air surrounding the insulator following the shortest distance. In case of a flash-over, the insulator continues to act according to its designed capacity unless it gets destroyed due to the excess heat. Puncture: In case of insulator puncture, electrical discharge occurs from conductor to pin through the body of the insulator. Sufficient thickness of porcelain (or the insulator material) must be provided to avoid a puncture breakdown. When such breakdown is involved, the insulator is permanently damaged. Safety factor of insulator: The ratio of puncture strength to flash over voltage is called as safety factor. It is desirable to have high value of safety factor so that a flash-over takes place before the insulator gets punctured. For pin type insulators, the value of safety factor is about 10. Each unit of disc is designed for a low voltage, say 11 kV. Hence, depending upon the working voltage, desired number of discs can be connected in series to form an insulator string suitable for particular voltage. If any of the discs in insulator string is damaged, it can be replaced easily. Replacement of the whole string is not required. In case of increased demand on the line, the line voltage can be increased and the additional insulation required for the raised voltage can be easily provided by adding the desired number of discs in the insulator strings. As the line conductors are suspended by suspension strings, they run below the earthed cross-arms of the towers. This arrangement provides partial protection from lightning. The suspension arrangement provides greater flexibility to the line. Suspension insulators are allowed to swing so that they can take up the position where mechanical stresses are minimum. At a dead end of a transmission line or at a corner or sharp curve, the transmission line is subjected to a great tensile load. In order to sustain this great tension, strain insulators are used at dead ends or sharp corners. 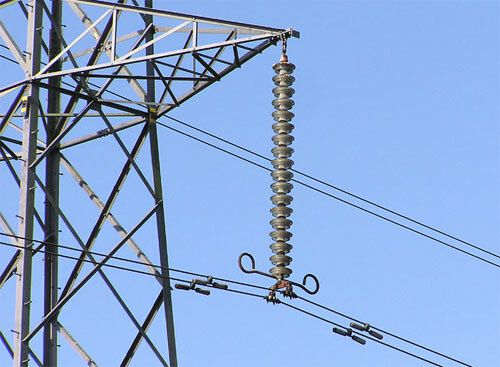 For high voltage transmission lines, stain insulator consists of an assembly of suspension insulators. In this case, the suspension string is arranged horizontally and the insulator discs are in vertical plane. Two or more suspension strings can be assembled in parallel to sustain greater tensions. 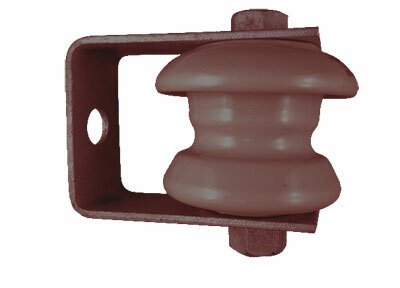 For low voltage lines (less than 11 kV), shackle insulators are used as strain insulators. Shackle insulators are used in low voltage distribution lines as strain insulators. A shackle insulator can be used vertically as well as horizontally and it can be directly fixed to a pole with a bolt or to the cross arm. However, the use of such insulators is decreasing after increasing the use of underground cables for distribution purpose. Some additional types of insulators are: post insulators, glass insulators, polymer insulators, long-rod insulators, stay insulators etc. Read about these additional types of insulators here.